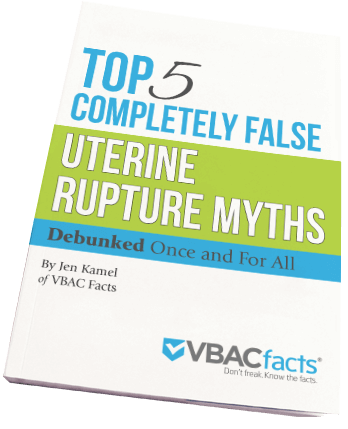 I read somewhere that the risk of uterine rupture is actually higher during pregnancy than during birth. Does anyone have a source for this? I had heard the same thing many times. However, no one who shared this stat with me could ever cite a study substantiating it. I looked and looked on and off for years and never found it. Instead, I found “Uterine rupture in the Netherlands: a nationwide population-based cohort study” (Zwart, 2009), “the largest prospective report of uterine rupture in women without a previous cesarean in a Western country.” Zwart differentiated between uterine rupture and dehiscence and included 97% of births in The Netherlands between August 1, 2004 and August 1, 2006. All told, Zwart studied 358,874 total deliveries, 25,989 of which were TOLACs. I have referenced Zwart before when comparing scarred vs. unscarred rupture rates and scarred vs. induced, unscarred rupture rates. Zwart also included data on pre-labor rupture which I will share with you as well. Zwart reported that 9% (1 in 11) of scar ruptures (women with prior cesareans) happened before the onset of labor. When we take 9% of the overall scar rupture rate of 0.64% (1 in 156)*, we get a 0.0576% (1 in 1736) risk of a scar rupture before labor. Zwart (2009) found 16% (1 in 6.25) of ruptures in women without prior cesareans (unscarred ruptures) occurred before labor and an overall unscarred rupture rate of 0.007% (1 in 14,286)*. When we multiply these two numbers, we get a 0.00112% (1 in 89,286) risk of uterine rupture in an unscarred uteri before labor. Remember, all these stats are based on one study. Other studies might find different rates. However, I think Zwart would have the most accurate rates to date as it is “the largest prospective report of uterine rupture in women without a previous cesarean in a Western country.” This is an important factor because uterine rupture in an unscarred woman is an extremely rare event. We need tens of thousands of women in order to get an accurate number. The fact that Zwart includes over 300,000 unscarred women is huge. Take home message: The risk of uterine rupture before labor is extremely rare especially for unscarred women. * This statistic includes non-induced/augmented, induced, and augmented labors.